Brisbane is set to become Emirates’ third Australian destination to welcome the airline’s flagship Airbus A380, with the announcement that Emirates will operate the A380 on the Dubai to Brisbane and Auckland route from 1 October 2013. Adding the A380 to one of Emirates’ two daily Brisbane services will see an increase in capacity of 135 seats for sale per flight and 1,890 week, reinforcing Emirates’ commitment to its Queensland and Auckland passengers. The double-daily service is currently operated by Boeing 777-300ER aircraft. “On the back of growing passenger demand on the route as well as demand for our flagship aircraft, we will become the first airline to bring the state-of-the-art A380 to Brisbane, offering Queenslanders the chance to experience this revolutionary aircraft and the best service in the sky first-hand,” said Salem Obaidalla, Emirates’ Senior Vice President Commercial Operations, Far East and Australasia. “The Dubai-Brisbane-Auckland route is a popular choice among business and leisure travellers alike and the new Emirates A380 service will be instrumental in helping Emirates meet its passenger demand as well as deliver considerable economic benefits through inbound seats and travel connections,” he continued. 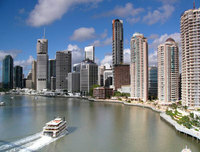 “Australia represents an important market for Emirates and ranks in the top three countries on Emirates’ global network. Central to this relationship is the ongoing support for tourism and trade provided by adding larger capacity aircraft between our two countries, and this fourth A380 for Australia will further complement our partnership with Qantas,” Mr Obaidalla concluded. Together with Qantas, from October a total of six daily A380 services will operate to Dubai, offering a seamless A380 experience through Dubai International Airport’s Concourse A, the world’s first purpose built A380 concourse, to 21 A380 serviced destinations on the network including London Heathrow, Manchester, Paris and Rome. Today’s announcement caps off a range of recent upgrades to Emirates’ Australian services, including the introduction of a daily Melbourne A380, a daily Adelaide service and a three times daily Perth service. A second A380 for Sydney from June has been announced. “This is also a significant announcement for New Zealand where we are continuing our growth, from 2 October Auckland will be welcoming its third daily Emirates A380. Emirates currently operates its A380s from Auckland to Melbourne and Sydney and on to Dubai and Emirates’ ever expanding global network. The third A380 will give our New Zealand customers more flexibility on their routes to Australia and onwards,” added Mr Obaidalla. Emirates sets the pace for A380 deployment, with the aircraft having carried 14 million passengers on 35,000 trips spanning 200 million kilometres since A380 operations commenced five years ago. In 2012 alone, Emirates added 11 A380s to its fleet and is the largest operator of the aircraft, with 33 in the fleet and 57 on order.